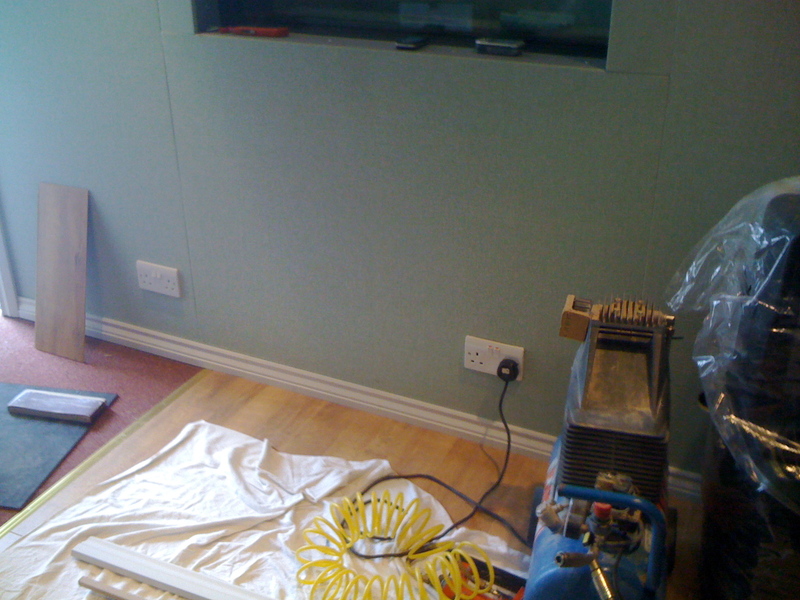 The final look of the control room - oak-coloured laminate floor, 'ginger' carpet tiles and the light green hessian. We’re done! The building part of the project is complete. 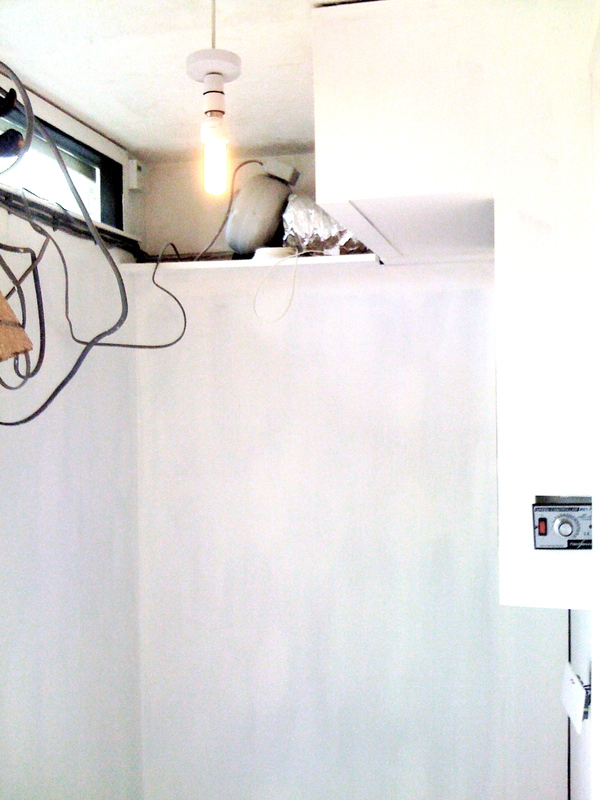 The final phase, in two weeks’ time, will be the building of furniture followed by the equipment installation. 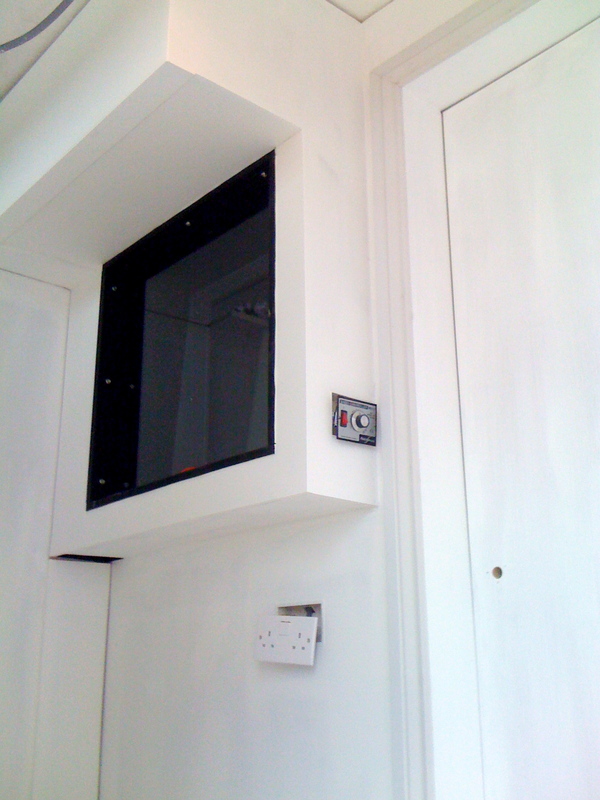 More on this in a few days’ time, as I start to set up my current studio kit in there. 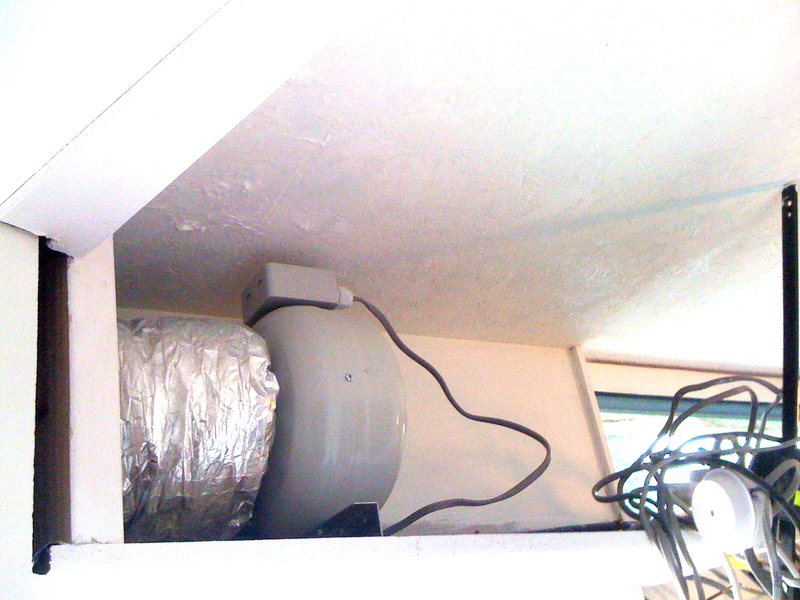 Jeff finished the last of the carpet tiling today, and there’s now nothing more to do to the building apart from tweak the aircon heatsink, and ‘box in’ one of the fans. Since the last post we’ve been working on the final bits of cosmetics, selecting colours (‘ginger’ carpet tiles and ‘antique light oak’ laminate flooring). Jeff and I took a run out to B&Q where he haggled with the staff (which you can do, apparently, if there is minor damage to the stock). 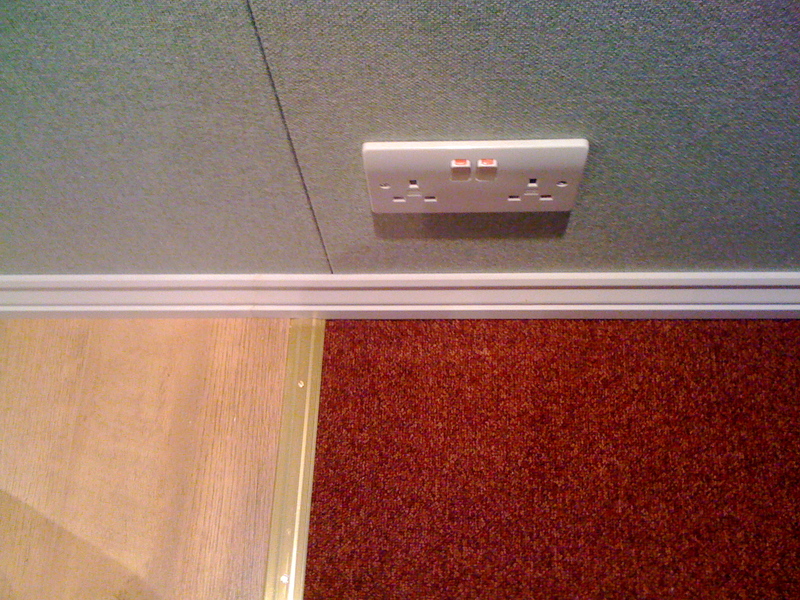 The control room floor is a combination of wood-effect laminate and carpet tiles. The laminate is actually preferable to wood, because I’ll need to be able to scoot around on a wheeled office chair (between analogue desk, Digi002, Mac and music keyboard) and a real wood floor wouldn’t be as durable as the high-quality laminate that Jeff uses. We’re only using laminate as far as the left-hand edge of the music keyboard (facing the live room window); the rest will be carpet tiles to avoid any reflections coming off the floor. The live room floor is all laminate – and I’m still asking around for rug ideas for the drum kit. What kind of rugs do drummers like anyway? Most drummers I’ve worked with seem to use a thin and moth-eaten Persian rug that smells a bit damp – but that may be an economic choice rather than a musical one. We’re treating the lobby as a utility area so its look is, er, utilitarian. 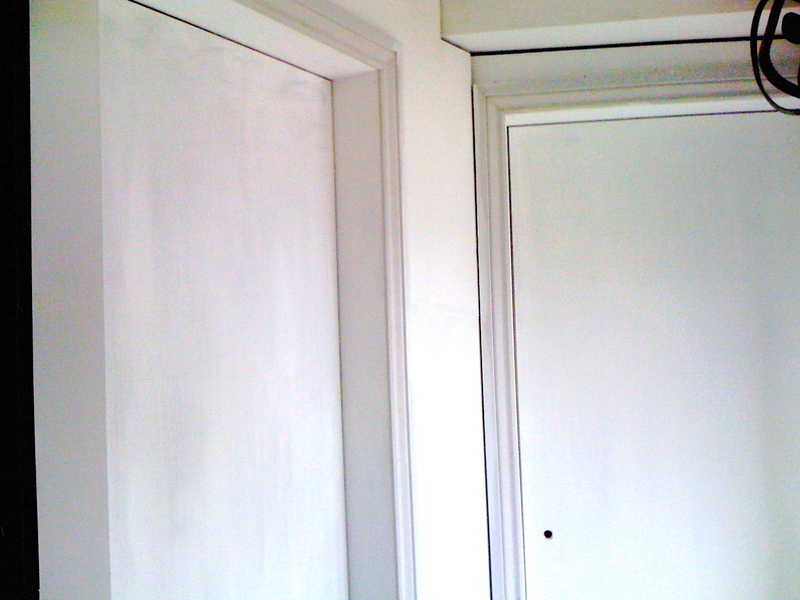 We’ve painted it all white, and left the hard surfaces of plasterboard panels, OSB ceiling and MDF door panels. It will be a great room for one particular guitar sound that I love – the loud-amp-in-a-small-room effect – although I don’t yet know how much ‘room’ I’ll be able to create in a space that size. Reamping was never really an option with my previous setup because of the need to avoid noise pollution for the family – looking forward to fiddling about with mic placements etc. The air fans are now fitted and working, so the cooled air in the lobby can be pushed through the ducts at the front of the control and live rooms – there’s a variable speed fan for each room. Jeff has advised me to locate the control for the live room fan outside the room in the lobby (“we don’t want drummers fiddling with it”). Personally I’d rather like to have a speed control for some of the drummers I’ve met ;-). The music keyboard area - the laminate goes as far as the left hand piano part. Mustn't play too many low notes. 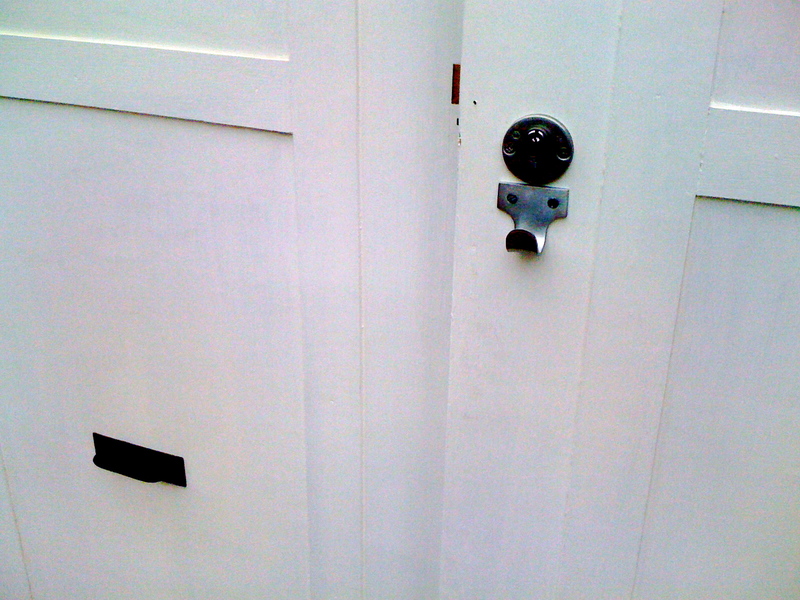 And our final B&Q purchase was a pair of black handles. These are purely to help with the ‘garage door’ illusion and neither of them are fixed to a real door. The finishing touch is the black handle. 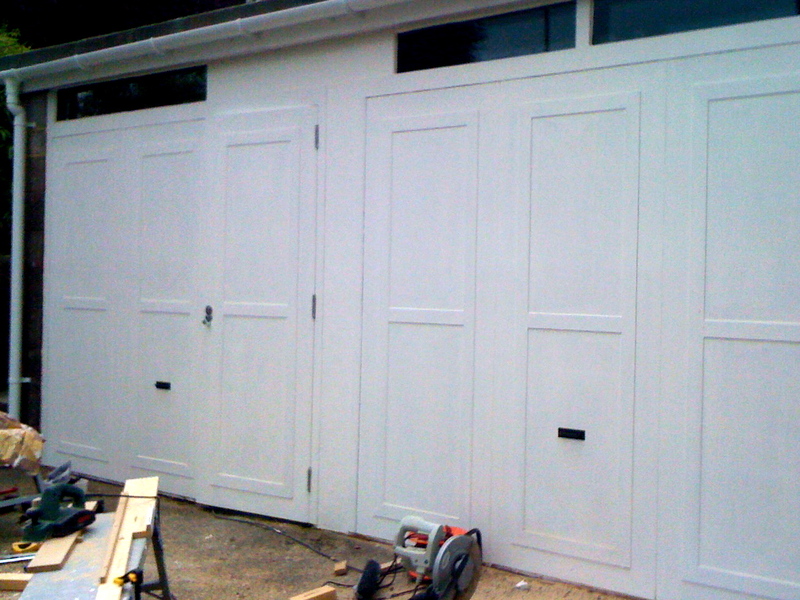 It's purely cosmetic (it's actually just screwed into a plywood wall) to achieve that 'garage door look'. The final look of the exterior - guttering has been added, and the door lock is now fitted. 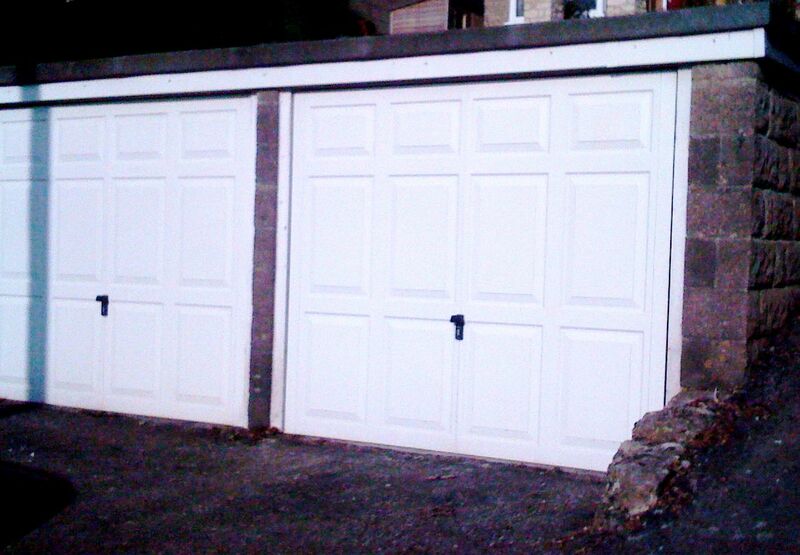 And here, for comparison, are the original garage doors. Jeff and Artis are off to start a large-scale acoustics job at Coventry University, so we all had a few beers last night to celebrate the end of the build phase of the project. During the evening Jeff impressed us with his uncanny ability to identify specific models of Ducati engine by the sound only. And Artis, of course, introduced us to yet more Latvian music. We got into a long discussion about how Skyforger have gone mainstream since they started introducing electric instruments, and started investigating which traditional instruments they played. This got us into talking about the Kokle – a Latvian zither/dulcimer/harp. Here’s composer Laima Jansone performing variations on some traditional folk tunes on the kokle. But you want more eighties hits perfomed by Latvians, don’t you? Happy to oblige. This time Artis has introduced us to an a capella band called Cosmos – sort of Flying Pickets with proper beatboxing. Check out this amazing version of Billie Jean.